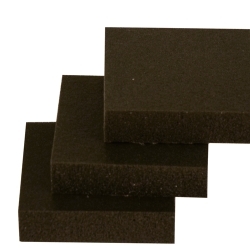 .1875" x 12" x 12" Black Soft Poron® Microcellular Urethane Foam Sheet | U.S. Plastic Corp.
Density: 15 lbs. per cubic foot. Durometer (Shore O): 12. Tensile Strength: 40 psi. Maximum recommended constant use temperature: 194°F. Maximum recommended intermittent use temperature: 250°F. Brittleness temperature: -40°F. 88518 – 88529 have a density of 15 lbs. per cu. ft.